Neither Andreea nor I practice any religion. Actually … I religiously stay away from anything religious (I am a bit harsher on these things then Andreea). Yet we do Christmas. It began in Israel when Andreea would get a holiday blues around the time of Christmas. So we got a small potted tree that only looked like a Christmas tree and grew with us over a few years (we left it planted near the last house we occupied in Israel) and some decorations. 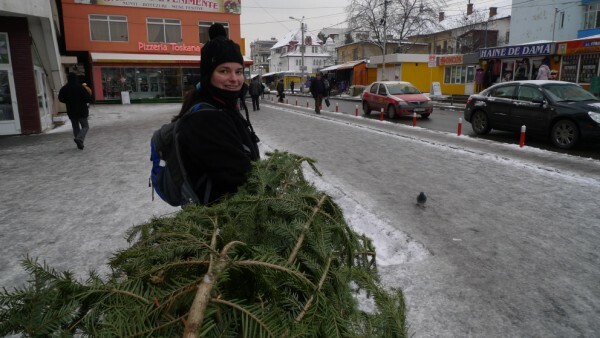 Eventually I asked Andreea what the tree “officially” symbolizes – and she couldn’t tell me and we looked it up. We found that it may very well be rooted in pagan traditions, and that Christian authorities piggy-backed on it for their own needs. So we did some picking and choosing and created our own symbology for it. Bringing a tree in-doors keeps us in touch with qualities of nature that surround us. Nature is resilient and abundant. Nature supports us. Nature changes and adapts softly and peacefully, even when facing harsh conditions. Nature peacefully brings together life and death in a neverending cycle of regeneration. All of these qualities and more permeate into our consciousness and walls by bringing a tree into our home. Ecologically it is a bummer to see all these trees cut, used and then tossed out like garbage. From what we know, at least here in Romania, the cutting of trees is (surprisingly) highly regulated and what is sold is actually just the tops of the trees (which hopefully grow back, maybe even more rejuvenated?). 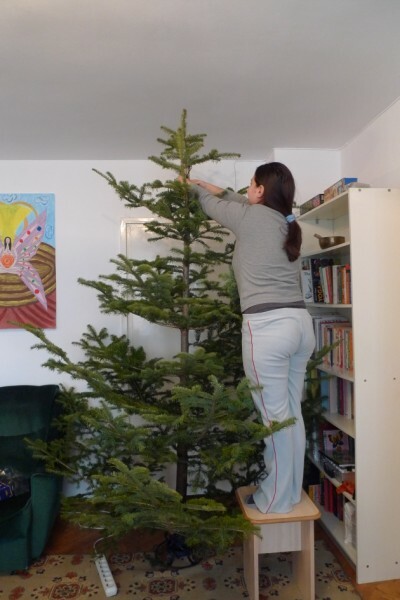 Personally, once we move into our permanent home, we will resume a practice we started in Israel of growing a tree over years and then planting it outside when it is too large and mature to have in the house. 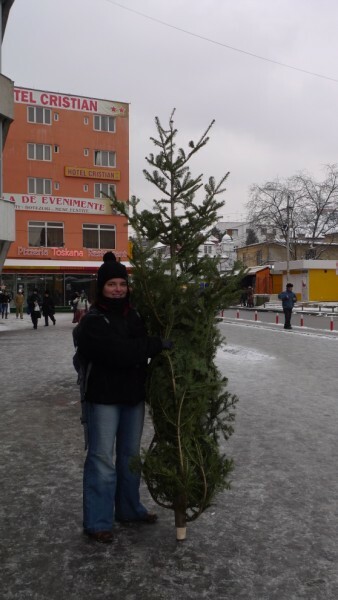 A few days ago I had my first amusing experience of carrying a tree home through the city. 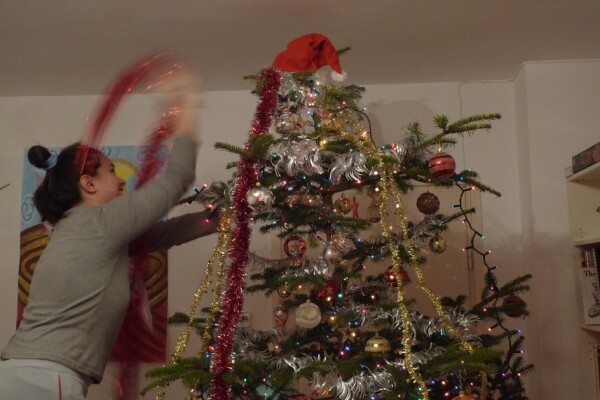 We didn’t see anyone else doing it (last year in Romania, most of the Christmas trees we saw in homes we visited were small plastic trees – which really don’t sit well with our symbology – fake is not a quality we are looking to bring into our lives) – so I felt a little like a celebrity. Quite a few people asked us where we got and how muh we payed for it – of course everyone turned to me to ask and, given my limited Romanian vocabulary, I had to send everyone to Andreea for further inquiries. 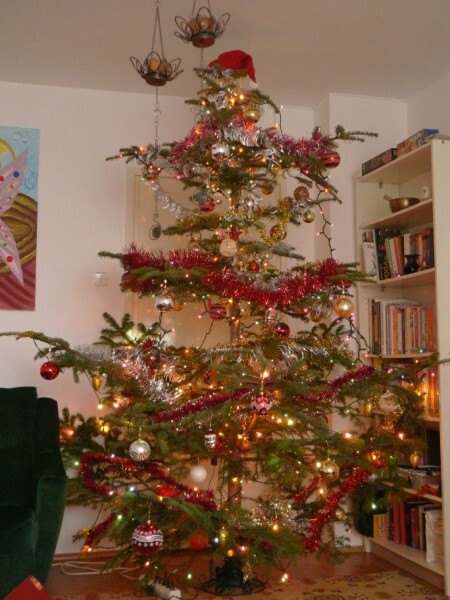 Oh … and one last thing … it is much easier to navigate a city with a Christmas tree carrying the root end first – that way the branches gracefully foldl away from any obstacles instead of relentlessly hooking onto everything and everyone.